be analyzed to provide critical economic information for Idaho and western region dairy producers. knowledge, well-informed producers, and increased adoption of the demonstrated technologies. Environmental Quality (IDEQ) as Best Management Practices (BMPs). 3. Solid separation reduces ammonia (NH3) emissions from liquid dairy manure. Liquid dairy manure samples were collected from a flushing receiving pit on each of three dairies. Triplicate samples were analyzed for solid content, particle density, particle size distribution, total nitrogen (TN), and total phosphorus (TP). Solid content was analyzed based on Method 2540B (APHA, 2015). 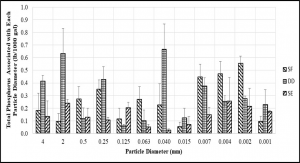 Particle density was analyzed based on the method ASTM D1217-15 (Weindorf and Wittie, 2003) using a pycnometer with a methanol medium for particle sizes of 4, 2, 0.5, 0.25, 0.125, 0.063, and <0.063 mm. 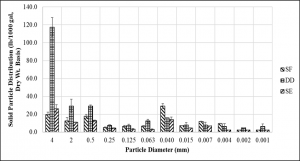 Particle size distribution was determined using a set of 6 sieves (4, 2, 0.5, 0.25, 0.125, and 0.063 mm) combined with the hydrometer method ASTM D7928-17 (Days, 2002) for particle sizes less than 0.063mm. Nutrient parameters (TN and TP) were analyzed using a Hach spectrometer (DR 5000) based on Hach methods TNT880 (for TN) and TNT845 (for TP) (Hach, 2005). The Pipette Methods ASTM D6913/D6913M-17 (Hellman and McKelvey, 1941) was used in conjunction with ASTM D7928-17 to extract liquid manure samples for analyzing the nutrient parameters. To obtain reliable results about centrifuge and screen separation efficiencies, liquid manure sampling and analysis will be repeated three times on three different dates in each of the four seasons. Each time, three liquid manure samples will be collected both before and after use of the centrifuge and screen from three cooperative dairies, respectively. The collected liquid manure samples will be kept in a cooler and immediately sent to a certified commercial lab, where solids, N and P concentrations in the liquid manure samples will be analyzed. At the same time, three separated solid samples from both the screen and the centrifuge will be collected. The collected solid manure samples will be kept in a cooler and immediately sent to the same commercial lab, where moisture content, N and P concentrations in the solid samples will be analyzed. To obtain reliable results about the NH3 emission mitigation effects of the centrifuge and screen, NH3 emission tests will be conducted three times on three different dates in each of the four seasons. All sampling will take place at the three cooperative dairies. The collected liquid manure samples will be brought back to the University of Idaho (UI) Twin Falls Research and Extension Center Waste Management Laboratory where NH3 emission tests will be conducted outdoors near the lab to reflect seasonal-ambient effects. The collected liquid manure will be well mixed before being distributed into five-gallon buckets with one gallon of manure in each bucket. Ogawa passive NH3 samplers (Ogawa & Co. USA, Inc., Pompano Beach, FL; Figure 1) will be used to determine the time-average concentrations of NH3 in the head space of the five-gallon buckets containing untreated (before the screen), screen-treated (after screen separator), and centrifuge-treated (after centrifuge) liquid manure. Four buckets in each category: (1) untreated, (2) screen-treated, and (3) centrifuge-treated liquid manure. A flow-injection analysis system (QuickChem 8500, Lachat Instruments, Milwaukee, WI) will be used to analyze NH4-N extracted from the passive sampler filters, which will have trapped NH3 in the head space of each bucket. The process for collecting and analyzing passive sampler samples is briefly stated as follows. First, after buckets have been filled with manure as described above, all buckets will be covered with lids. Two two-inch holes will be made in each lid for placing passive samplers into and pulling passive samplers out of the headspace of each bucket. Five passive samplers will be placed into each of the buckets. At 2, 4, 8, 12, and 24 hours after placing the passive samplers, a passive sampler sample will be collected from each bucket. Immediately after pulling the passive samplers, sampler filters will be transferred using clean forceps into individual 15-ml centrifuge tubes. The filters in each centrifuge tube will be extracted using 5 ml 1 M KCI (potassium chloride) for 30 minutes in a reciprocating shaker. The extractant will then be filtered with 0.45 μm filter discs into 8 ml glass culture tubes. The filtered extractant will be analyzed for NH3 using the QuickChem 8500 system. Flushing liquid dairy manure solid particle densities of three dairies are shown in Figure 1. 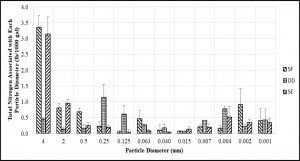 The particle densities of three dairies were found to be similar ranging from 1.32 g/cm3 for particle sizes larger than 4 mm to 2.20 g/cm3 for particles less than 0.063 mm. Figure 1. Flushing dairy manure solid particle density of dairies SF, DD, and SE. Flushing liquid dairy manure solid particle distributions of three dairies are shown in Figure 2. It was noticed that high bedding fibers were presented in the liquid manure from Dairy DD which resulted in a higher percentage 32.6% of solids with particle sizes larger than 4 mm. For both Dairy SF and Dairy SE, the percentages of solids (dry weight basis) with particle sizes larger than 4mm were 8% (=19.5/240.9) and 17.2% (=26/150.7), respectively. Most mesh sizes of inclined screens used on Idaho dairies were larger than 0.5 mm. The percentages of solids (dry weight basis) with particle sizes larger than 0.5mm were 20.7%, 48.9%, and 33% for dairies SF, DD, and SE, respectively. The percentages of solids (dry weight basis) smaller than 0.001 mm that remained in liquid stream were 45.6%, 29.5% and 37.8% for Dairy SF, Dairy DD, and Dairy SE, respectively. Figure 2. Flushing dairy manure solid particle distribution of dairies SF, DD, and SE. Flushing liquid dairy manure total nitrogen (TN) and total phosphorus (TP) associated with different particle groups are shown in Figures 3 and 4. TN and TP distributions varied from dairy to dairy. There were 33.6% and 43.9% of TN associating with particles larger than 0.5 mm for Dairy SF and Dairy SE, respectively. There were 17.8% and 19.4% of TN associating with particles smaller than 0.5 mm for Dairy SF and Dairy SE, respectively. There was 6.5% of TN attaching to particles larger than 0.5 mm and there were 33.3% of TN attaching to particles smaller than 0.5 mm for Dairy DD. Screen separation did better job on Dairy SF and Dairy SE in terms of capturing TN, but TN separation efficiency of screens on Dairy DD was low. Most TP was attached to fine particles with sizes less than 0.5 mm for the three dairies. In order to separate more TP out of liquid stream, advanced separation methods beyond inclined screens are needed. Figure 3. Total nitrogen (TN) associated with each particle group in flushing liquid dairy manure. Figure 4. Total phosphorus (TP) associated with each diameter group in flushing liquid dairy manure. A total of 45 solid and liquid manure samples were collected before and after centrifuges and inclined screens from three collaborating dairies in December 2018 and these manure samples were analyzed for solids, N and P. These analyzed data will be used to evaluate efficiencies on capturing solids, N and P from liquid dairy manure by two different separation technologies. Liquid dairy manure samples were collected before and after centrifuges and inclined screens from three collaborating dairies in December 2018 for evaluating ammonia emissions from centrifuge and inclined screen treated and untreated liquid manure. A total of 160 NH3 emission test samples were analyzed. These data will be used to evaluate effects of centrifuges and screens on mitigating NH3 emissions. We will continue both the evaluation of efficiencies on capturing solids, N and P and NH3 emission test monthly in 2019. We presented the results of liquid dairy manure solid/nutrient distribution tests at a producer workshop in August 2018 and at the Idaho Nutrient Management Conference in November 2018. A peer-reviewed proceedings paper entitled “Liquid dairy manure solid distribution” was published in the Proceedings of Idaho Nutrient Management Conference, November 15, 2018. We will be presenting the project results at Idaho Cereal School in February 2019, Waste to Worth conference in April 2019, and ASABE Annual International Meeting in July 2019.